Developmental dysplasia of the hip is a general term referring to a spectrum of deformities, usually diagnosed in the neonatal period, in which the structural relationship of the proximal femur to the acetabulum is intermittently or continuously abnormal. The spectrum includes (i) a subluxatable or dislocatable hip associated with capsular laxity in which the head of the femur moves partially or totally out of the acetabulum with extension and adduction and back into it with flexion and abduction, (ii) a subluxated hip in which there is a partial but persisting loss of the normal relationship of the head of the femur to the acetabulum in extension with the head more lateral than normal in the acetabulum and the acetabulum more shallow than normal with its lateral roof angled outwardly and upwardly, and (iii) a dislocated hip in which there is a complete and persisting loss of any femoral head-acetabular relationship, regardless of the position of the hip. 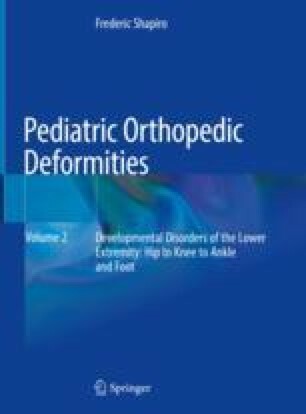 Developmental dysplasia of the hip (DDH), as currently defined, is not associated with clinically evident connective tissue, neuromuscular, or other diseases. The single most important initial pathoanatomic change appears to be a capsular laxity which renders the hip unstable at birth with all subsequent abnormalities being secondary phenomena which develop an increasing variation from the norm the longer a hip is allowed to grow with any persisting malposition. The terminology used to describe this condition has always been variable and imprecise primarily due to the imperfect understanding of the pathoanatomy and timing of its initial occurrence.